Party! You will be able to party all night long and then sleep any time in quite and comfort because the party area is located away from your apartment dorm making our hostel the best place to both party and sleep, rest or chill out. We have a variety of bed arrangements from private to dorm style that will fit everyone’s needs. 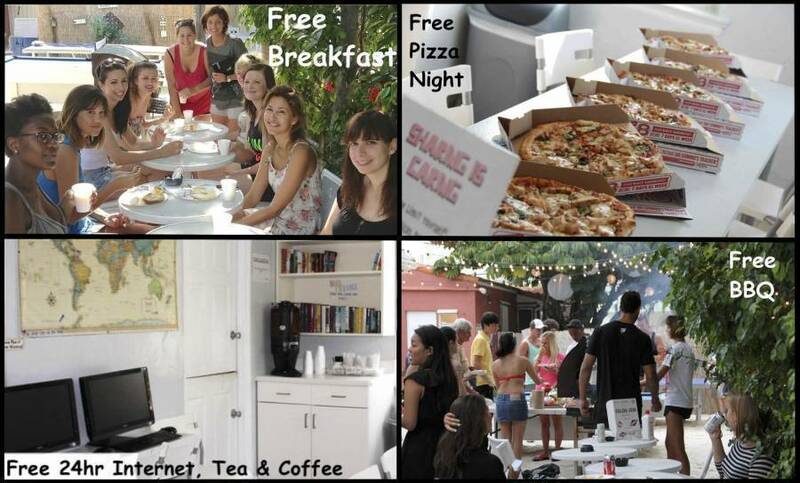 At Bikini Hostel, Cafe & Beer Garden we'll make sure that you feel like you're home. We've got the cleanliness, professionalism and boutique style of a hotel but without the stiff formality and prices. Not only will you be referred to by your first name, but also our friendly multi-lingual staff will go above and beyond to share their local knowledge and make your stay memorable and pleasant. After you have been either on the road all day, or walking around in the city, you'll be able to relax in our cozy and friendly common areas, have a drink, talk and make friends. You can walk to Lincoln Road shopping, the sparkling beaches, popular and super-healthy Whole Foods grocery store, the movie theater, a romantic walk on Espanola Way’s outdoor cafes & restaurants, or hanging out with the locals at Starbucks coffee. You’ll have the greatest opportunities to meet and join new friends at our planned daily activities and suggested nightly dance clubs. 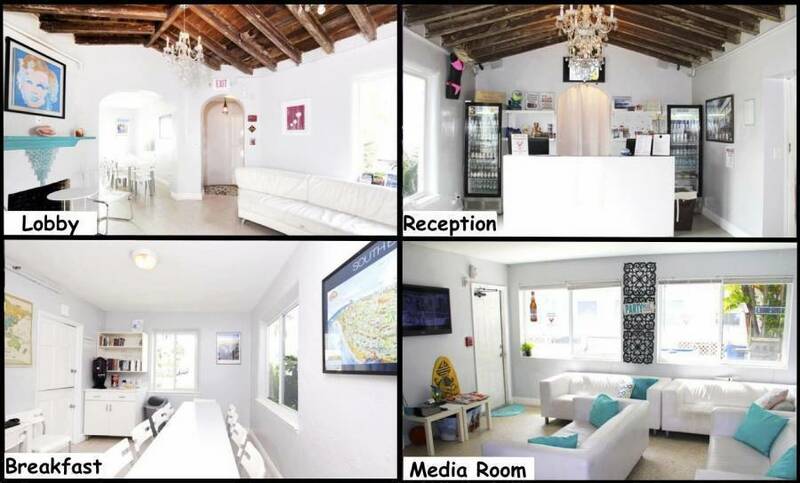 Staying at the Bikini Hostel, Cafe & Beer Garden, you are next to Flamingo park with it’s Olympic size swimming pool, soccer fields / free basket ball courts, and across the street from us are the intracoastal water way views of Miami Beach’s tropical palm tree islands and downtown Miami’s nightly lit up skyline! Diagonally across the street enjoy the weekend DJ pool parties at the Mondrian Hotel - where the hottest beautiful bodies groove to the sexiest music all day long! Check-in: 3pm. Check-Out: 11am. It is free to make reservation changes emailed by 3pm, 3 days prior to the reservation start date, at which point the first night fee & tax is non refundable and automatically billed to guarantee the reservation. Thirteen percent taxes are not included and added upon arrival, when the balance of payment is due by cash or credit card with a five percent fee. Two dollar daily resort Fee. The hostel has the right to refuse service to anyone and rates are subject to change at any time. 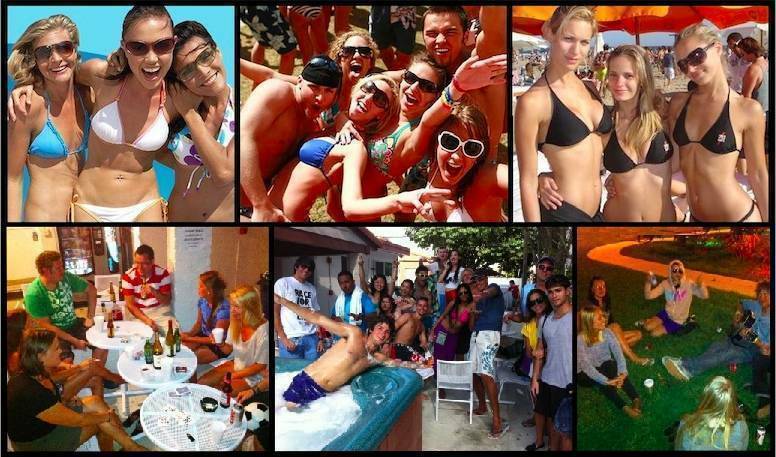 As we are registered as a Backpacker Hostel, Bikini Hostel is intended for transient tourists. Therefore, we cannot accommodate local or nearby residents, maintain the right to refuse service to anyone and rates are subject to change at any time. Passport or Non-Miami/Out of State I.D or Drivers license required to check-in. No shows and early departures are billed the balance of the reservation. 21 days is the maximum stay. Minimum Age 18. When booking other than a private, friends sharing same room is not guaranteed. **Take I-95 south to 395 East, this will take you over the bay on the MacArthur Causeway. Stay on the left to exit onto Alton Road. Once on Alton Road turn left at 12th Street, then turn right on West Avenue. Bikini Hostel, Cafe & Beer Garden will be on the right hand side. 1) Supershuttle - Busses depart frequently, no reservations required, although recommended. Cost is approximately $22 each. 2) Taxi - $32 per car excluding tips. 3) Public Bus – 150 Airport flyer lower level of Airport take bus to 16th and Washington. Then take the South Beach Local bus going south to 1255 West Ave.
4)Rent a Car - See kiosks at airport for information or visit these car rental agency websites to book a car rental online. The front desk can also assist you with car rentals once you arrive.